The Wisteria catalog is dedicated to sharing the stories of nonprofit organizations with their customers. 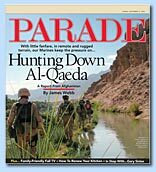 OIC ws thrilled to be featured in November. Army officers drove to the OIC Warehouse from Ft. Leavenworth to spend the day preparing school supplies for shipment. Actors Gary Sinise and Jamie Farr stopped by the OIC Warehouse to help pack School Supply Kits. American Airlines and OIC return from Iraq after airlifting 20 tons of school supplies for U.S. troops to distribute to children. 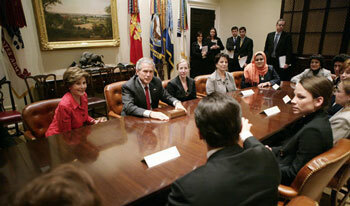 OIC co-founder Gary Sinise was awarded the Presidential Citizens Medal on December 10, 2008 by President George Bush. The medal is the second highest civilian honor awarded to citizens for exemplary deeds performed in the service of the nation. Scott Thompson, staff writer for The Leavenworth Lamp, discusses the multiple benefits derived from the efforts of organizations like OIC, which work to assist the troops. OIC co-founder Gary Sinise traveled to Kansas City, MO on February 28, 2007, and stopped by to visit the Operation Iraqi Children warehouse before performing with the Lt. Dan Band that evening for the soldiers at Ft. Leavenworth. 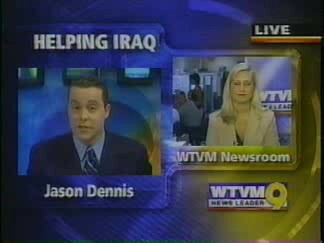 Gary Sinse discusses the experiences that led to his co-founding of Operation Iraqi Children. Comedian and former Marine Dave Bogan organized his second large-scale OIC supply collection in Milwaukee in September, 2006. Donors contributed nearly 500 School Supply Kits and almost $2,000. U.S. Servicemembers in Afghanistan brought school supplies from Operation Iraqi Children to a school in the Parwan Province that had been damaged by arsonists. The director of education for the province and the Charikar District representative to congress accompanied the soldiers and airmen on their mission. Actor and director Gary Sinise and his Lt. Dan Band rocked the Pentagon today, kicking off the second annual "America Supports You" salute concert commemorating Military Appreciation Month. A group of students from the School of Business at the University of South Dakota sent 670 School Supply Kits to Operation Iraqi Children. The kits were collected and assembled by participants in Coyoteopoly, an interdisciplinary student service learning project. 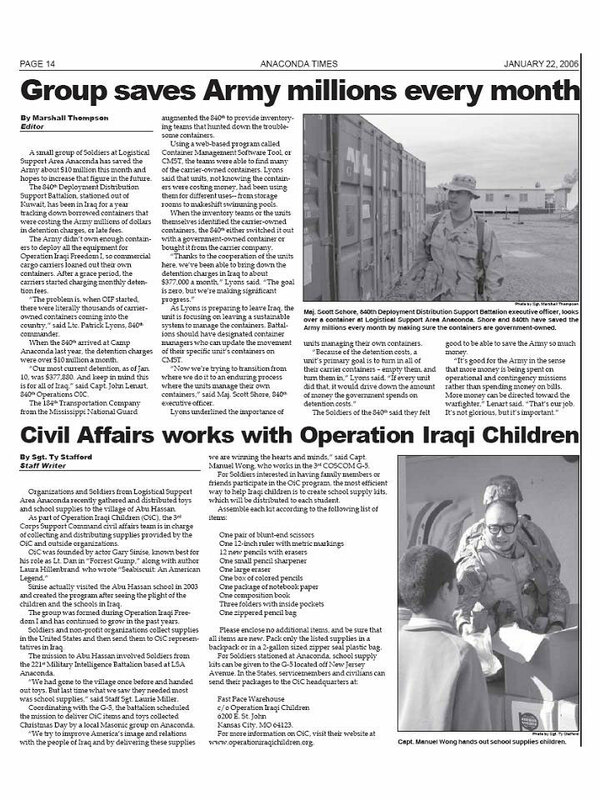 Air Force Maj. Ray Powell is working to bring Operation Iraqi Children, an organization based in Kansas City, Mo., to the attention of the Fort Leavenworth community. The OIC program puts together school supplies into kits and sends them to Soldiers overseas who distribute them to children needing the most basic classroom tools. 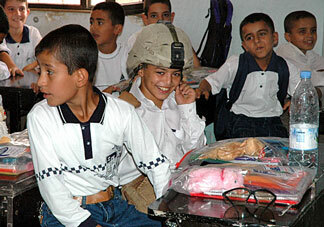 Iraqi Children effort, bringing much needed school supplies to children. 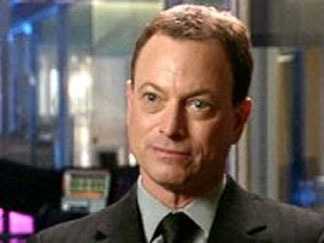 When not appearing on the CBS show "CSI: New York" as Detective Mac Taylor, actor Gary Sinise devotes much of his time to raising support for U.S. troops. Sinise, who is planning his third trip to Iraq with the United Service Organizations, appeared on ABC's "This Week" today to talk about his new venture to help the children who have felt the effects of the war in Iraq. Organizations and Soldiers from Logistical Support Area Anaconda recently gathered and distributed toys and school supplies to the village of Abu Hassan. 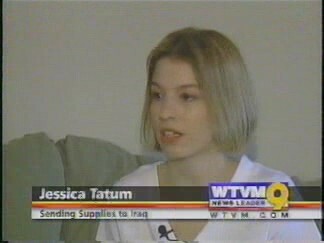 As part of Operation Iraqi Children, the 3rd Corps Support Command civil affairs team is in charge of collecting and distributing supplies provided by OIC. (CBS) Oscar-nominated actor and the star of "CSI: New York," Gary Sinise is using his star power to improve the lives of Iraqi school children. BALAD, Iraq - The helicopter’s blades cut the afternoon sky as the Blackhawk flew fast and low to the ground, passing over villages and farmlands, skimming over tops of palm trees, and following the occasional road. Actor Gary Sinise tells how he and Seabiscuit author Laura Hillenbrand are racing to get school supplies into the hands of Iraqi children. Stage and screen star Gary Sinise—Oscar-nominated for his role as Lieutenant Dan in Forrest Gump—may be the only actor who’s gone twice to Iraq to entertain the troops. He’s certainly the only one who’s created a foundation to help Iraqi schoolchildren. OIC co-founder Gary Sinise spoke to "This Week" on ABC News about his trip to Iraq and what led him to found Operation Iraqi Children. 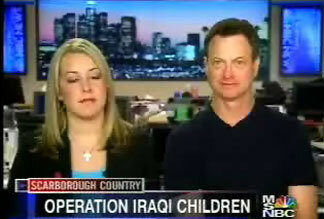 Actor Gary Sinise, co-founder of Operation Iraqi Children and Shauna Fleming, founder of A Million Thanks appeared on Scarborough Country to give us the good news coming from Iraq and update us on how their organiztions are helping American soldiers. "In the last telephone conversation I had with Johnny we talked about how children of Iraq were, the conditions they had to live in, and he compared the children there to his nephew, Bryce, my son." Johnny had a deep love for his 3-year old nephew. Because of that, Iraqi children will benefit. Iraqi children will soon see basic school supplies, pencils, paper, scissors, glue and crayons. "He never said it, but I knew if things had gone the way we hoped, and he came home, that if he'd learned about this organization and he would've taken part in it himself." And although her brother is now a memory, she makes sure he lives on through his nephew.